It’s hard not to feel bad for Gareth Edwards, director of Rogue One: A Star Wars Story. The guy was asked to direct a stand-alone Star Wars film that felt new and fresh while simultaneously resonating with fans who watched Star Wars: Episode IV – A New Hope. He also had to direct a film that would satisfy the moviegoers who grew up with Star Wars: Episode I – The Phantom Menace. The creative gaps he had to bridge with this project were near impossible to close, but yet he somehow managed to make it all work. Is Rogue One a perfect movie? No. It certainly has its flaws. Most notably is the skimpy backstory for every major character, from Jyn Erso (Felicity Jones) and Cassian Andor (Diego Luna), to Saw Gerrera (Forest Whitaker) and Chirrut Îmwe (Donnie Yen). The Star Wars franchise is enough of a cultural juggernaut that millions of people are already emotionally invested in this story (i.e., Who captured the Death Star plans from the Empire and how did they pull it off? ), but the screenplay by Chris Weitz and Tony Gilroy was too lean. But I digress. Galen Erso (Mads Mikkelsen), and Imperial scientist, is forced at gunpoint to leave his family and work on the Death Star. His wife is killed, but his daughter escapes to a hideaway and is saved by Saw Gerrera. The Rebellion has many factions, often working at odds with one another. Rebel Jyn Erso is captured early on in the movie but is rescued by Cassian and his repurposed Imperial droid K-2SO (Alan Tudyk). Cassian has been a part of the Rebellion since he was six years old and has had to make some tough (deadly) decisions working in the world of espionage. It is revealed in a smuggled hologram to Saw that Galen has secretly engineered a kill switch into the Death Star. If the Rebel Alliance can get the plans, then there is chance they can end the threat to the galaxy. The Rebellion plans to use Jyn as a way of working with her old guardian, Saw, who is seen as an extremist. Elements of the Rebellion do not plan on working with Galen once he is found. Instead, they plan to kill him. A series of events convinces Cassian that Galen truly was a good man trying to do his best in a horrible situation, and before long he, Jyn, and a motley crew go “rogue” to capture the plans to the Death Star. Initially reluctant bureaucrats within the Rebellion come to their aid when the crew of Rogue One put boots on the ground in enemy territory. 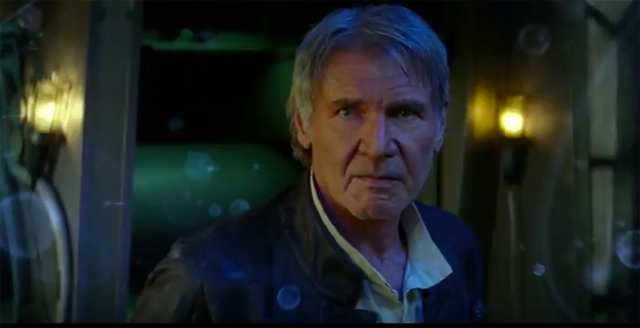 The movie ends right where Star Wars: Episode IV – A New Hope picks up. In short, if you want to see a good Star Wars movie that emphasizes the “war” aspect of the franchise, then you should see Rogue One. It has a scene with Darth Vader that is worth the price of admission alone, solid space battles, and plenty of The Force courtesy of Donnie Yen’s character. If you don’t overthink the movie, then you should have a good time in the theater with friends and family. Editor’s Note: Feel free to head on over to The Conservative Book Club to check out the review I did for them. The new Rogue One trailer came out this morning, which means the “social justice” force field to protect lead actor Felicity Jones was immediately deployed. The way the internet works is that as long as two anonymous people say something then a story can be written about “some men” — or just “men” if editors are particularly angry. Here is the thing about the Rogue One trailer: It looks interesting. Is there any Star Wars fan out there who wouldn’t want to see how the Rebel Alliance managed to steal plans for the Death Star? Of course not. Added bonuses: Donnie Yen and Forest Whitaker have roles, the movie has a gritty look, and it opens up new possibilities for the Star Wars universe. With that said, it is also a natural reaction for men to raise an eyebrow when Jones’ character, Jyn Erso, beats up stormtroopers as if drunk octogenarians are wearing the armor. Are there tough women out there? Sure. Can female leads be convincing action stars? Of course. 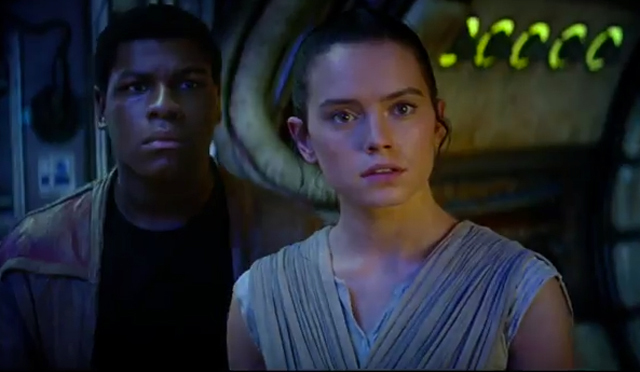 That is one of the many reasons why I gave Star Wars: The Force Awakens rave reviews. In general, however, a 120-pound woman is not going to stand a chance against a 200-pound man in a street brawl — let alone a group of 200-pound men. Sorry. It’s just not happening. To get upset at men who point that out after viewing a movie trailer is absurd. Regardless, at the end of the day, Rogue One looks intriguing. If the movie does well, then the only thing Disney will have to worry about will be over-saturating the market with Star Wars flicks. That is a good problem to have. Remember: Even a person who enjoys chocolate cake will turn it down if you give them too much. Let me know what you think of the Rogue One trailer in the comments section below. Should Felicity Jones be the main character? Will she nail the role, or will she be choke like Admiral Motti before Lord Vader? Lucas, who has always been protective of his series and even refers to them as his “kids,” hasn’t been looking back well on the deal with Disney (via Collider). The father of “Star Wars” also opened up about why he and Disney were split on their decisions for the franchise’s future. Lucas apologized when some lawyers from Disney started screaming in his ear, but the damage is already done. He showed his hand. Here is the truth: George Lucas — the guy who has a “ranch” that we might as well call Skywalker Plantation — is much more of a “white slaver” than Disney will ever be. George Lucas surrounded himself with yes-men and created his own fiefdom, where computer experts were holed up inside dark rooms for years to make monstrosities like Jar Jar Binks. Men who might as well be called indentured servants toiled away so finicky Lucas could barge in and criticize their hard work. Note: Watch the behind-the-scenes specials on the prequels to see how people cower in fear when Lucas comes around. Watch as otherwise-talented men bow down and submit to Lucas’ stupidity because he somehow managed to bring the original trilogy into existence. Episode I: Horrible. Lucas called it “bold.” It’s also “bold” to take a bowel movement in the middle of Times Square, but it’s still unacceptable. Episode III:Barely passable. Lucas must have received help with the script. Someone intervened behind the scenes. There is no doubt. Episode IV: Classic. Young George Lucas, saddled with setbacks, takes part in a truly collaborative project and creates a winner. Episode V: Great movie. Note that it was directed by Irvin Kershner with a screenplay by Lawrence Kasdan. Episode VI: Good movie, but shaky. We see the divisions between “white slaver” Lucas and writer Kasdan on full display. Episode VII: Bravo. 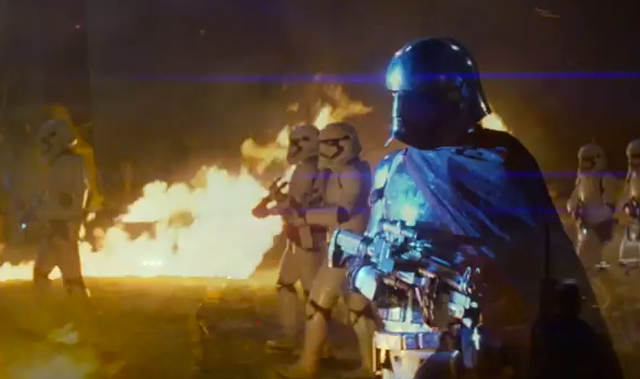 J.J. Abrams and Kasdan begin to “make things right.” A return to form. Notice how ungrateful George Lucas, after taking $4 billion dollars, turns his nose at the idea of giving fans what they want. The kicker, not picked up by most media outlets, comes when the guy who sells merchandise like Watto sneered at American capitalism. He then had the gall to say he cares more about the craft of writing than Hollywood. I almost feel sorry for George Lucas. What a pathetic attempt to revise history. When rational human beings think of a Top 10 list of movies where a director allowed story to suffer as he got lost in his desire to fool around with new technology, the prequels will always make the list. I honestly did not want to rehash the prequels, but since George Lucas has the nerve to accept a $4 billion dollar check and then call the guys who wrote it “white slavers,” then his ego needs to be chopped down like the losing party in a lightsaber fight. Make sure to catch the part of Red Letter Media’s review where they cover Lucas’ private screening of The Phantom Menace. It is incredibly telling. Mark Hamill says that you are “insane” if you don’t vote for Barack Obama. Apparently, Mark doesn’t think it’s insane that the federal government’s profligate spending forced it to pay more net interest on its publicly held debt in 2011 than it spent on the Department of Education. Mark Hamill’s BMI suggests he hasn’t been training in the Dagobah system anytime within the past decade, but that’s no excuse for why he couldn’t answer a simple question at at San Diego Comic-Con 2012. A reporter asked “If you can pick one of your characters or one of Stan Lee’s characters, who would you dress up as?” Everyone’s favorite Skywalker used it as a springboard for a weird Occupy Wall Street-tinged attack on Gov. Mitt Romney. Why would a Hollywood actor do such a thing when he was completely unprovoked? The answer: He’s scared. There really is no other reason why someone would take an innocuous question that has nothing to do with politics and use it as an opportunity to let loose with ad hominem attacks and political screeds. Mark Hamill should have remembered Yoda’s advice: “Fear is the path to the Dark Side. Fear leads to anger. Anger leads to hate. Hate leads to suffering.” He didn’t, and the result was that he came across as the strange guy who is so obsessed with politics that he has to inject it into neutral environments and sour everyone’s mood. Regardless, since Mark wanted to talk about Robin Hood and how “romantic” it is to steal from people, let’s look at IRS data, shall we? It looks like Mark Hamill’s definition of “the rich” includes a lot more people than, say, liberal billionaire George Lucas. The top 10% of wage earners paid 71% of all federal income taxes, and the top 25% of wage earners paid 88% of federal income taxes. 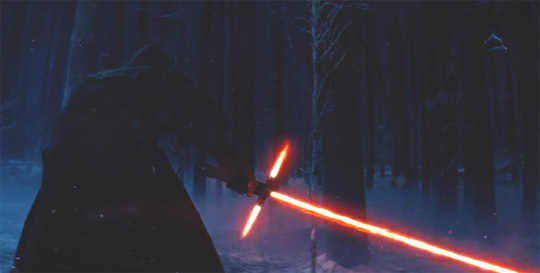 Any way you slice it (even with a lightsaber), the “wealthy” and the middle class are paying more than their fair share. But again, according to Mark Hamill, you must be “insane” if these stats — which come from the Internal Revenue Service — bother you. 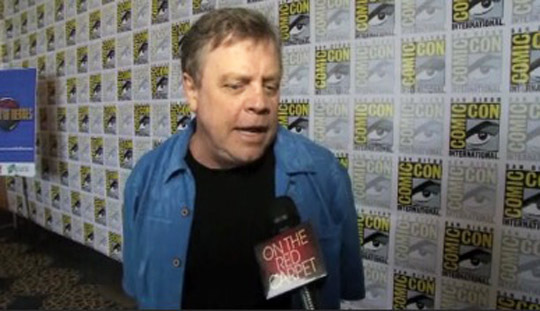 Interestingly enough, the last question Comic-Con’s red carpet reporter asked Mr. Hamill was, “What’s it like to kind of be a God when you walk into a place like this?” Instead of saying, “I’m not a God and I shouldn’t be treated as one,” Hamill embraced the reporter’s premise and answered with a smile. Fitting, since it’s obvious that the actor imagines himself as a philosopher king straight from Plato’s Republic and he sees Barack Obama as our saving Sovereign from Hobbes’ Leviathan. Mark Hamill has spent much of his life living in the world of science fiction and “romantic” tales. 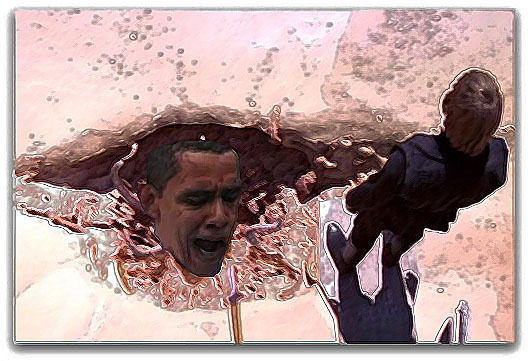 Those of us in the real world have to deal with the consequences of a confiscatory federal government that resembles the sarlacc pit monster. It’s not fun. Luckily, these days we usually only have to listen to guys like Hamill when he makes the rounds at comic book conventions.